This report on a 4-acre spider web covering a building has made shiver and curl in disgust. You are looking at the Baltimore Wastewater Treatment Plant, where 4 acres of their facility were covered by a spider web made by an estimated 107 million spiders. That's 35,176 spiders per cubic metre! 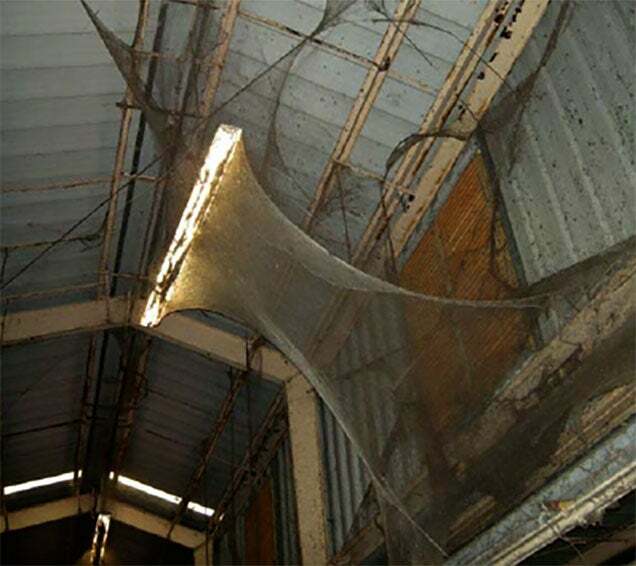 We were unprepared for the sheer scale of the spider population and the extraordinary masses of both three dimensional and sheet-like webbing that blanketed much of the facility's cavernous interior. Far greater in magnitude than any previously recorded aggregation of orb-weavers, the visual impact of the spectacle was was nothing less than astonishing. In places where the plant workers had swept aside the webbing to access equipment, the silk lay piled on the floor in rope-like clumps as thick as a fire hose. Yes, that's a lamp being pulled by a spider web. You know what I think?